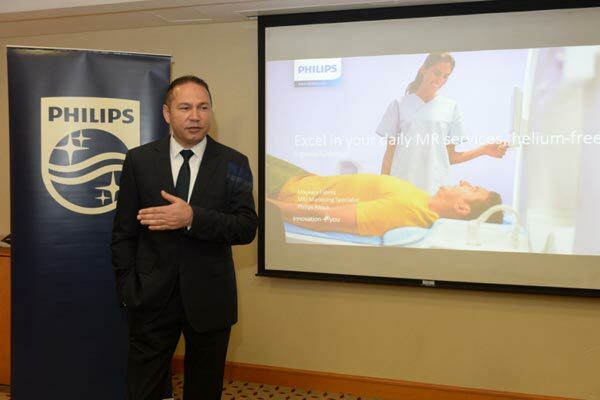 Philips Egypt announced the local launch of the Ingenia Ambition X 1.5T MR at the recently concluded African Society of Radiology (ASR) conference in Cairo. This new innovation is the latest advance in the Ingenia MRI portfolio, which comprises fully-digital MRI systems, healthcare informatics and a range of maintenance and life cycle services for integrated solutions that empower a faster, smarter, and simpler path to enabling a confident diagnosis, said a statement from the company. The first commercial installation of the Ingenia Ambition X was recently completed at Spital Uster Hospital, a major provider of extended primary healthcare in the canton of Zurich, Switzerland. The Ingenia Ambition X is CE marked and has received 510(k) clearance from the US Food and Drug Administration (FDA). In radiology, meeting the need for high productivity and an improved patient experience while ensuring excellence in imaging can be daunting. The perception is often that MR represents a trade-off between productivity and image quality. The Ingenia Ambition X provides leading-edge MR imaging capabilities while helping to increase overall productivity, combining its revolutionary BlueSeal magnet with innovations that can help reduce downtime, enable single operator workflow and speed up exam times by up to 50 per cent. “BlueSeal is breakthrough MRI technology and we’re proud to be first to market. The fully-sealed magnet dramatically reduces the amount of liquid helium needed to cool the magnet to less than half a percent of the current norm,” he said. “This results in significant operational benefits for our customers, including a smaller, lighter and more flexible installation footprint and a more efficient return to normal operations if an interruption in service should ever occur,” he added. Incorporating Philips’ breakthrough BlueSeal fully-sealed magnet, the Ingenia Ambition X is the world’s first MR system to enable helium-free operations, reducing the chance of potentially lengthy and costly disruptions, and virtually eliminating dependency on a commodity with an unpredictable supply. The fully-sealed system does not require a vent pipe and is around 900kg lighter than its predecessor, significantly reducing the siting challenges presented by conventional magnets and lowering construction costs. The Ingenia Ambition X includes a range of innovative features that combine to deliver a step-change in productivity. With Philips’ EasySwitch solution, the BlueSeal’s magnetic field can be easily turned off if an item becomes stuck in the bore. Once the problem is resolved, an in-house or Philips technician can initiate an automated ramp-up to bring the magnet back to field, minimising operational downtime. A conventional MR can require two staff to manage daily operations. The Ingenia Ambition X combines guided patient setup and Adaptive Intelligence-driven SmartExam analytics for automatic planning, scanning and processing. This frees up time to enable a single operator to manage the full scan from the patient’s side with just a single touch of a button. Philips Compressed SENSE is an advanced acceleration application that reduces exam times by up to 50 per cent. In addition, Philips VitalEye is a unique approach to detecting patient physiology and breathing movement.